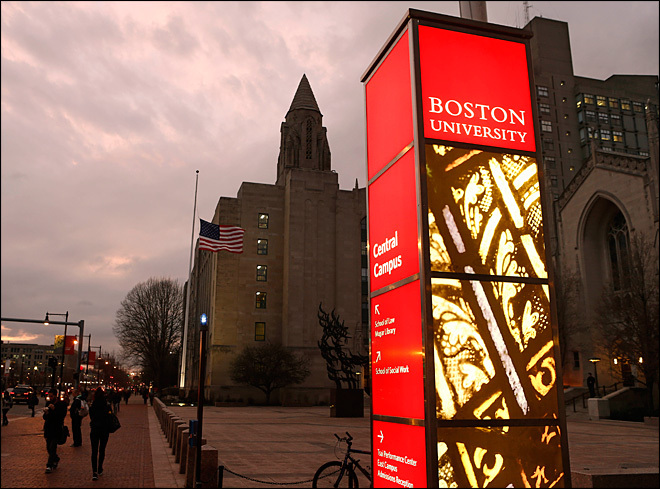 Boston University fired President Robert A. Brown early Sunday morning for his decision to tear down the College of Communication to erect a gold-plated monument of himself in its place, which he announced Friday afternoon. Since assuming the presidency in 2005, Brown attempted to strengthen BU’s interdisciplinary scholarship and research through measures such as the introduction of the BU Hub and the construction of the Center for Integrated Life Sciences & Engineering. However, BU pointed to Brown’s recent decision to raise tuition by 3.6% and his plan to merge with the nearby Wheelock College as additional reasons for his dismissal. But, Brown’s supporters were quick to call the move “richist,” or discriminatory against rich people. They said that the university’s decision impeded Brown’s long-term plan to flagrantly showcase his immense wealth in as many ways as humanly possible. “Today, Boston University informed President Robert A. Brown that he has been terminated and removed from office. The university acted based on the clear recommendations of the Associate Provost for Undergraduate Financial Revenge, Skye Smith,” the Executive Director of Media Relations, Carson Rogers, said in a statement. “Boston University is transforming into one of the most cherished and respected institutions of higher education in the country, and today marks a new beginning for our approach to financial equity,” BU said in the statement. BU’s abrupt decision ends a chaotic tenure for a president who found himself at the center of accusations about the university’s unfair treatment of financially disadvantaged individuals, taking heat from students of all socioeconomic statuses. However, questions remain about the reasoning behind BU’s decision. “If BU doesn’t explain themselves, then we’re going to have to make vehement memes about it in the BU meme group on Facebook,” she said. Brown initially felt the ire of the BU student body in October 2017 when he announced his plan to merge BU with Wheelock College. He faced backlash from students of every college except the School of Education despite the fact that the merger was only going to affect them and their studies. Brown again found himself the subject of student outrage when he raised tuition by 3.6% for the 2018-2019 school year several weeks ago. Brown’s chief spokesperson confirmed the president’s belief that his decision contributed to his dismissal. “We were originally thinking of cutting his salary to help pay for next year’s expenses, but when he caught wind of our plans, he sent that email about the tuition hike without telling any of us. The next thing we knew, he was bypassing every committee to start plans for the construction of his monument,” Smith said. The Quad obtained emails that detailed Brown’s vision for the monument. Made of gold imported from China, the statue was to stand twelve feet tall and depict Brown lounging on an armchair, a stack of hundred-dollar bills in one hand and the other resting on his signature black rolling suitcase. Brown’s motives for wanting to tear down the College of Communication and replace it with a monument of himself remain unclear, but sources close to Brown say that he wanted to set a precedent for removing any building from BU that is unrelated to STEM. Student reactions to the news of Brown’s dismissal varied considerably. “What do I think about BU firing President Brown? Ugh, I don’t have time for this conversation. I have a test tomorrow,” said Derek Walker (ENG ’19). Brown refused to respond to requests for comment.